You don't have to hike all day or do big miles to get the most of the great outdoors in and around Flagstaff. Here are some of my favorite local hikes that will leave you with plenty of energy to go dancing afterward. 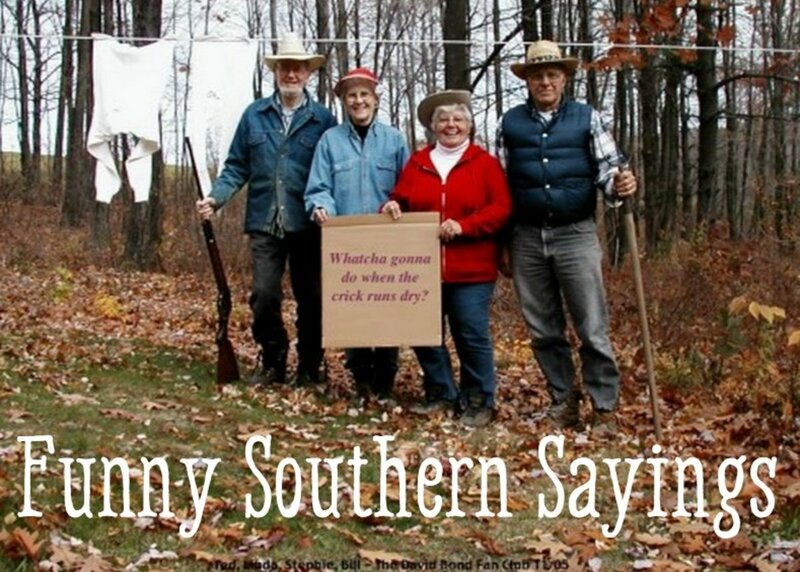 Or go on another hike! See trail descriptions and directions to the trailheads below each big photo from the hike. I've done all of these Flagstaff hikes, so feel free to ask me any questions in the guestbook below. All images on this page were taken by me or my man, Jeremy Kingsbury, while hiking these trails. Pick Up a Flagstaff Trails Map - Don't leave home without it ... I don't! I've used my Flagstaff Trail Map so much over the years, I'm on my second one. The first one eventually came apart at the seams. This map has helped me find and plan hikes and figure out which fork in the trail to take at times. When I moved to "Flag" and got one of these maps, my goal was to hike every red line on it. And I met my goal years ago, hiking many of these great trails numerous times. The map has also been very useful for off-trail hiking. This map shows 200 miles of hiking, biking, and equestrian trails and 25 miles of Flagstaff Urban Trails (FUTS) in a 375-square mile area. I love this hike. It's only a couple of miles round-trip, but I can spend hours exploring in and around the hidden gem that awaits at the end of the trail, in the "belly" of Red Mountain. From the trailhead, it's an easy walk up a wide trail and a wash to your destination. The only difficulty for small children and dogs along the way is a relatively short ladder not long before you reach the end of the trail. It's not difficult to climb or descend the ladder, but children and dogs may need a lift. 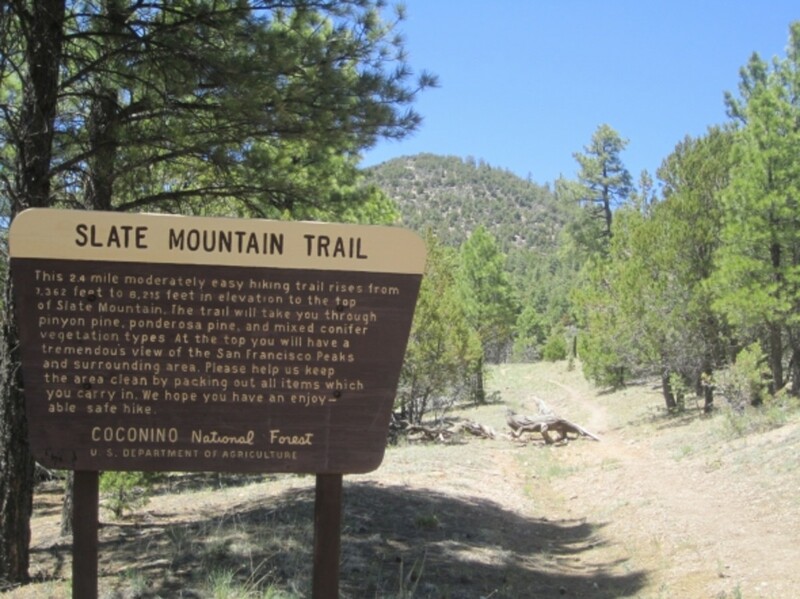 The trailhead is located just off of Route 180, 25 miles north of Flagstaff. Look for a roadside sign indicating the turnoff, and drive a short way up a well-maintained dirt road to the parking area. This is a sweet hike. Sweet, as in a very pleasant, moderate walk, with wonderful views and well-groomed trail. And nice little interpretive signs along the way, identifying various flora (although the signs are old enough now that some of the plants they refer to have died). I covered the two and a half miles to the top -- about a 900-foot climb -- in less than an hour, then parked myself on a convenient log and enjoyed the scenery, including Kendrick Mountain, the San Francisco peaks and Grand Canyon's North Rim. A hike up Slate Mountain is the perfect kind of hike to include in one's vacation plans, because it's not overly strenuous if you're in decent shape, and it will reward you with a terrific overview of northern Arizona. There's a nice open area at the top, just right for a picnic lunch. Later, when you return to your vehicle, and if you feel like doing some more walking, Red Mountain is just up the road. From downtown Flagstaff, take Highway 180 north 35 miles to Forest Road 191 on the left. (There is a sign for Slate Mountain at the road, but it's easy to fly right past if you're going the speed limit. No big deal; there's a road on the right a short distance ahead, where you can pull off and turn around.) Take 191 two miles to the trailhead on the right. FS 191 is fine for passenger cars in dry weather, but don't attempt it if it's been raining unless you have 4wd. I drove it in a low-clearance car and was fine, though the road is rocks in some places. I've done this hike up the old cinder cone several times over the years I've lived in Flagstaff. I like it because it doesn't take all day (an hour or two, more like, not including exploring the caves and picnicking on the summit), it gets your heart pumping on the 500-foot climb but isn't extremely difficult at all due to the long switchbacks, and the views at the top are outstanding. I also enjoy exploring the "old caves." 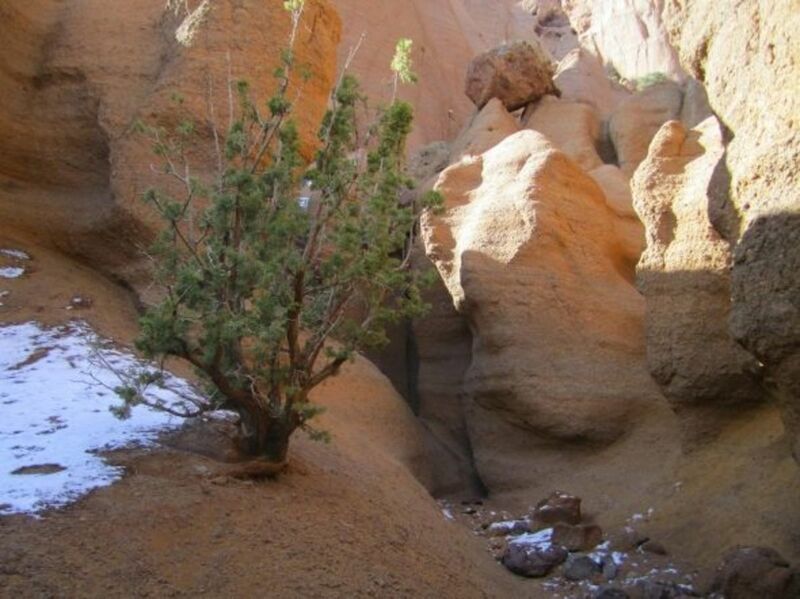 The Old Caves Crater Trail takes you through volcanic cinder fields, pinon juniper forest, and Ponderosa pines as you climb this old volcano. 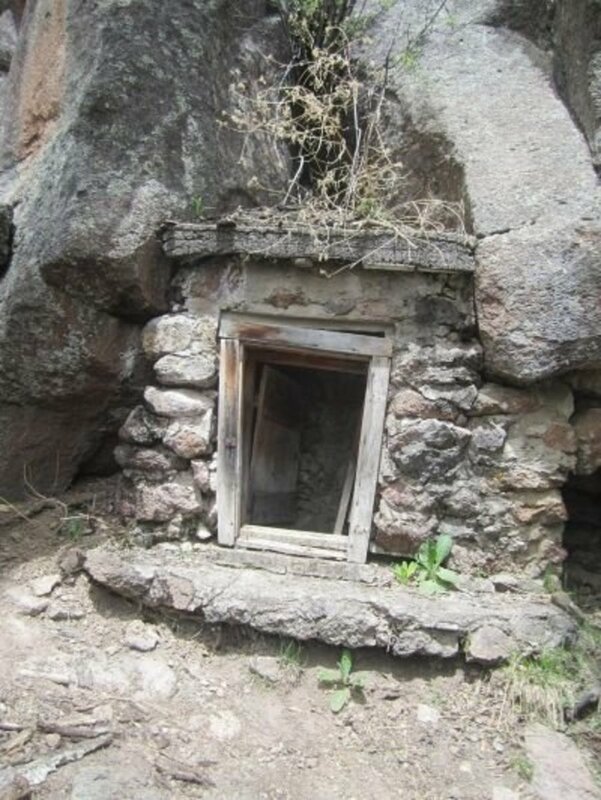 At the top of the trail, you can go right and visit the small caves, once inhabited by the Sinagua indians until about the mid-1300s, and then to the left to the summit. From there, the trail descends the other side of the crater and meets up with the main trail down at the bottom where you can continue back to the trailhead. There is another trail, called the Crater Loop Trail, that circles all the way around the base of the volcano. 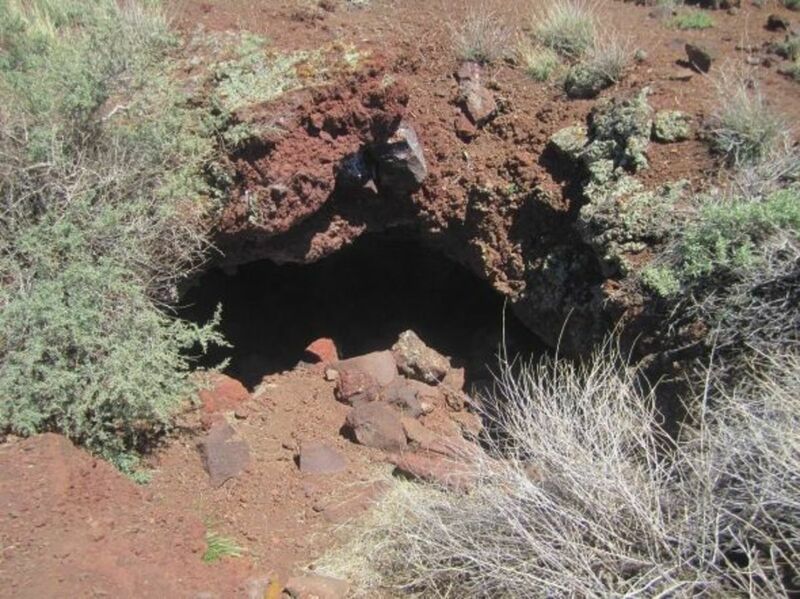 See trail maps of the Old Caves Crater and Crater Loop Trails on the Forest Service website. 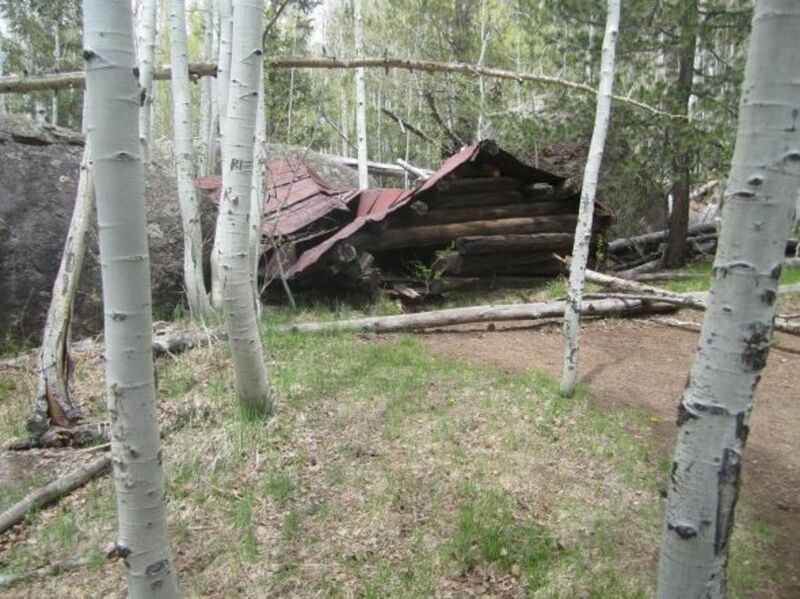 This hike is located 3.5 miles northeast of the Flagstaff Mall off Hwy 89. Drive north on Highway 89 from downtown Flagstaff to Silver Saddle Road. Turn right (east) on Silver Saddle and continue half a mile to the trailhead on the left, where there's a fenced parking area. The Fat Man's Loop hike begins at the Elden Lookout Trailhead parking lot along Hwy 89. Soon after starting on the main trail, you'll come to a fork. Take the right fork, pass through a fence and hike along the base of the mountain. In less than half a mile, you'll see a sign for Fatman's loop and Elden Lookout. Go to the left, towards Mt. Elden. 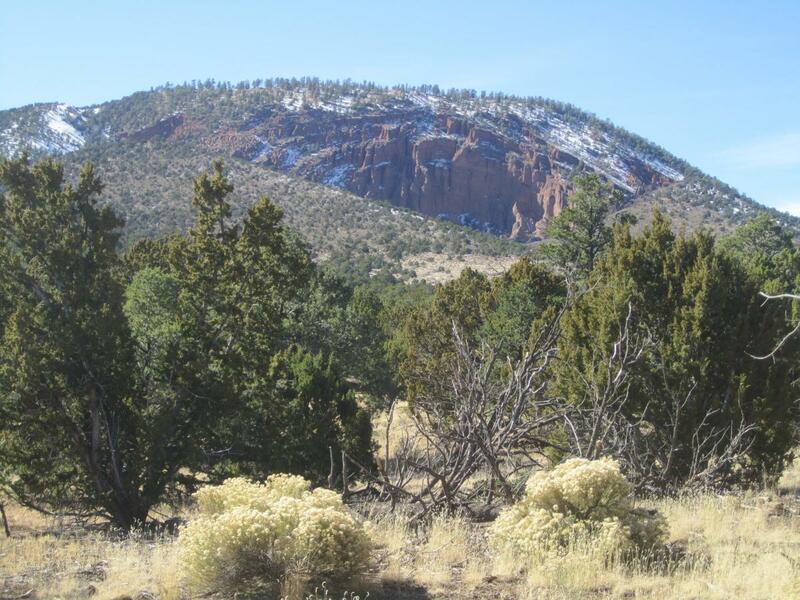 From here, you'll climb fairly steeply--yep, this hike has some ups and downs--and you'll soon have views of Doney Park and the lava cliffs on Mt Elden. At a mile and a half, you'll come to another fork in the trail. Go right and you'd end up climbing Elden. To continue on Fat Man's Loop, go left, which is downhill the rest of the way. The trail will lead you through gaps in large boulders, one of which is kind of a tight squeeze and the gap that gave Fat Man's Loop its name. At mile two, you'll come to the junction with the Pipeline Trail. You'll see a sign, with distances to the Oldham Trail & Buffalo Park. From downtown Flagstaff on Route 66/89, go east, past the mall and look for the Mt. Elden parking area on the left, with the split-rail fence around it. You'll see a sign for the "Mount Elden Trail" and a paved driveway into the parking lot, which can get pretty full or fill up entirely on weekends, especially in the summer. 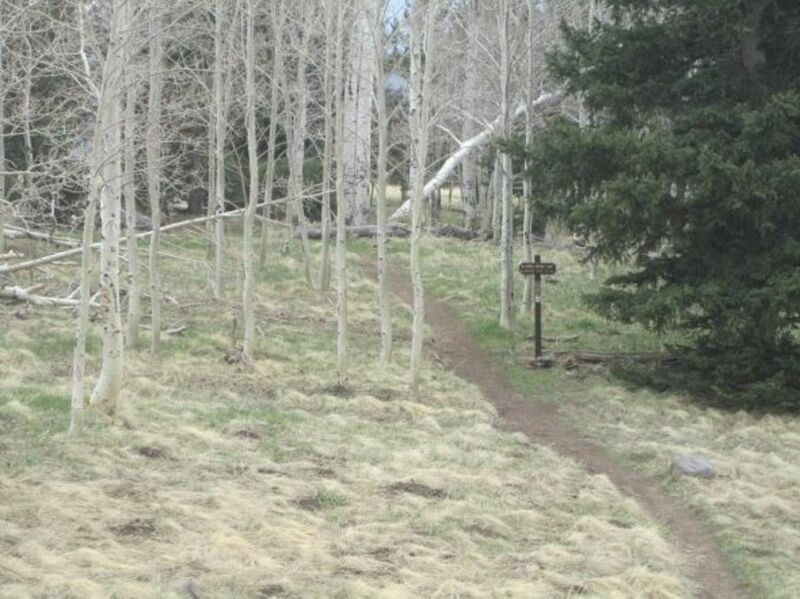 This loop trail is a beautiful, relaxing walk in the woods and through aspen-lined meadows. Along the way, you'll come to a spur trail that leads to Ludwig Veit's Cabin (pictured above), built in 1892. The 160-acre homestead has a storage shed and well you can explore. The cabin itself has been cut down to about 5 feet tall, so you can't actually go inside. But it's still fun to see. You'll also see a plaque commemorating the late Lamar Haines and his efforts at wildlife preservation. Keep an eye out for pictographs on the rocks in this area. Walk around the "depression" in front of the spring house (you'll see a worn trail) and look for a small cave, then on the rock face above it. This is a great hike for the kids because of all the exploring there is to do around the old cabin and the nooks and crannies in the rocks. Once when I did this hike, I found wee little "shrimp-like" critters swimming around in a pool of water in a bowl-shaped boulder. From downtown Flagstaff on Route 66, take Humphreys Street north. Turn left at the light onto Ft. Valley Rd/Hwy 180. Go north on 180 to Snowbowl Rd. on the right. Take Snowbowl Rd. about four miles up till you reach the small trailhead parking area on the right. This is known as the Lamar Haines trailhead. In the winter, you'll see signs for "permit parking only." 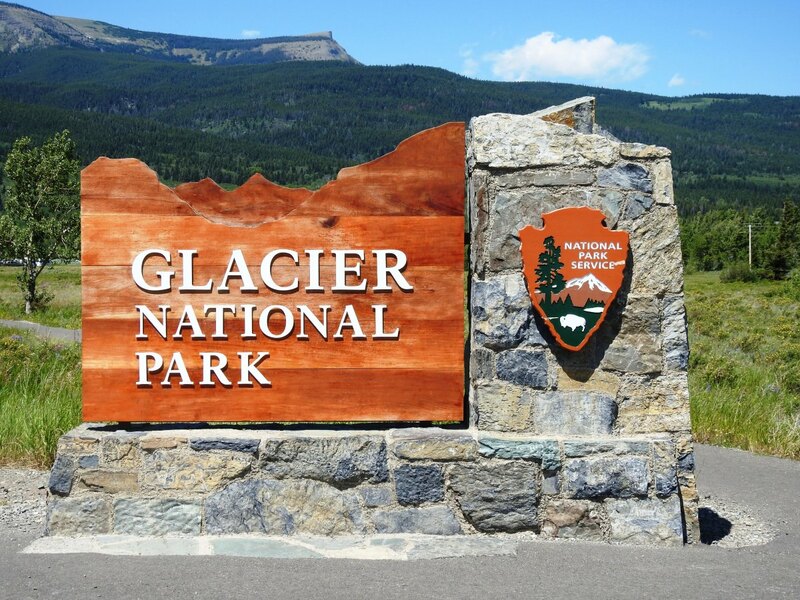 The free backcountry permits are available at the Peaks Ranger Station. 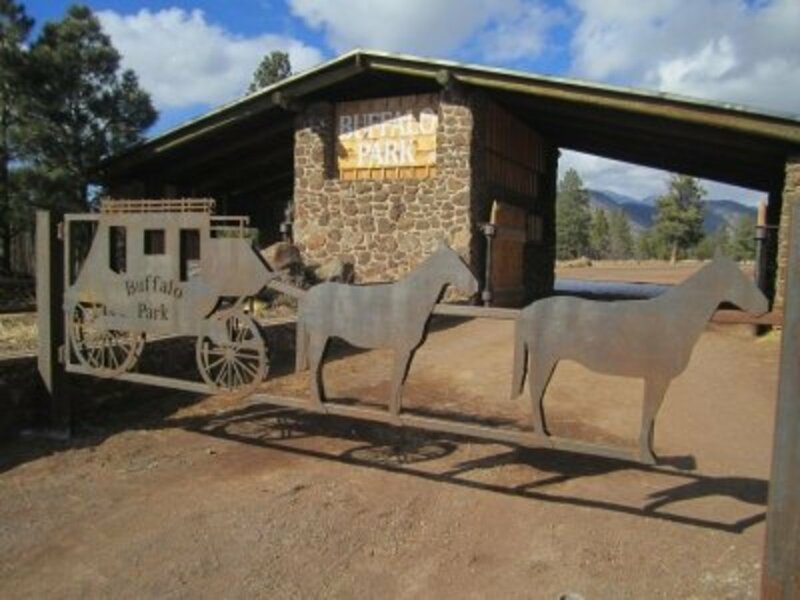 The Watchable Wildlife trail loops through the edge of Kendrick Park, which is a huge meadow surrounded by ponderosa pine and aspen, with excellent views of the San Francisco Peaks and Kendrick Mountain. As the trail name implies, keep a lookout for all kinds of animals, such mule deer, elk, pronghorn, coyote, Abert's squirrel, badgers. Birds you may see include the Steller's jay, mountain and western bluebirds, mountain chickadees, violet green swallow, hairy woodpecker, and red-tailed hawks. 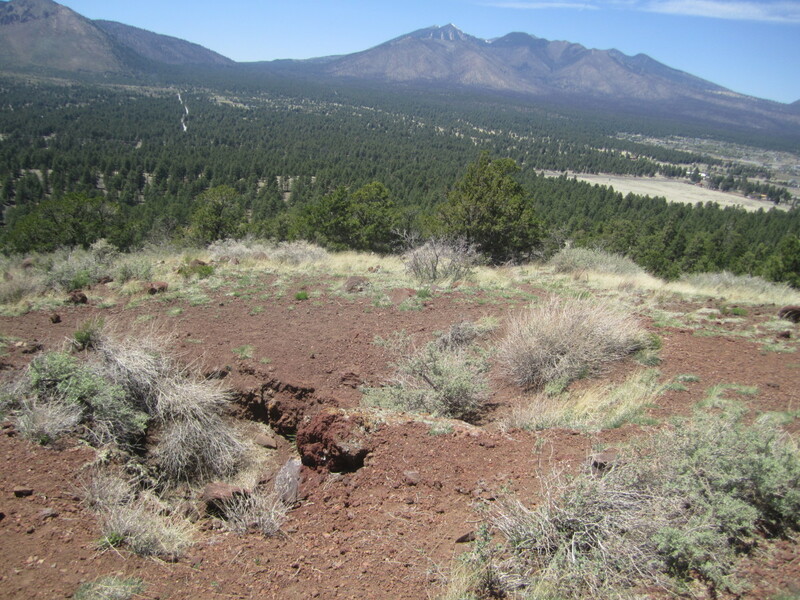 The trail is approximately 20 miles north of Flagstaff on the southern end of Kendrick Park, west of Hwy. 180. 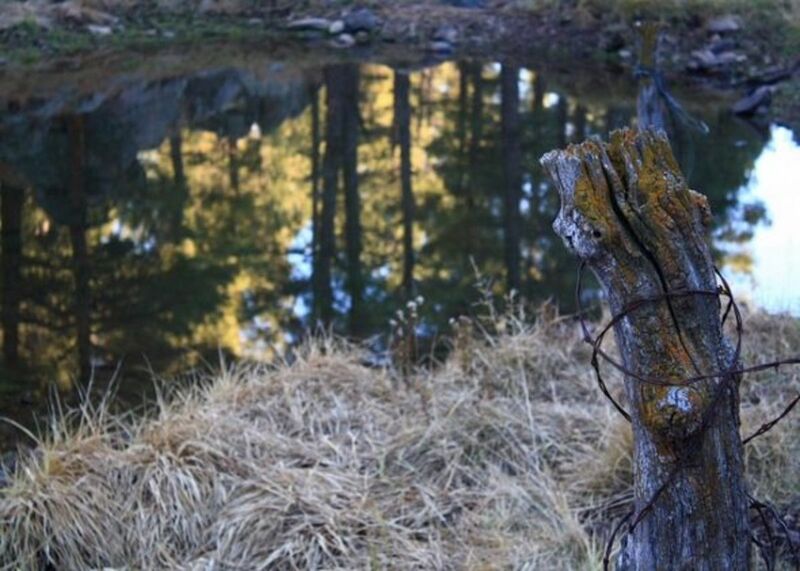 This loop hike offers a beautiful experience in the San Francisco peaks without a lot of strenuous work. It's also a good hike to help you get acclimated to high elevation before undertaking other more difficult trails on the mountains. The Aspen Nature Trail trailhead is at an elevation of 9,271 feet. From the trailhead, which you can see in the photo above, and along the hike, you'll enjoy awesome views of Kendrick, Sitgreaves and Bill Williams mountains as you walk through aspen, fir and pine trees and alpine meadow. Follow the signs and look out for the intersection with the Arizona Trail. From downtown Flagstaff on Route 66, take Humphreys Street north. Turn left at the light onto Ft. Valley Rd/Hwy 180. Stay on 180 for to Snowbowl Rd. on the right. Take Snowbowl Rd. all the way up (7 miles) to the ski area, to the lower parking lot on the left. The trailhead is just below the end of the parking area, where the trail enters the aspen. 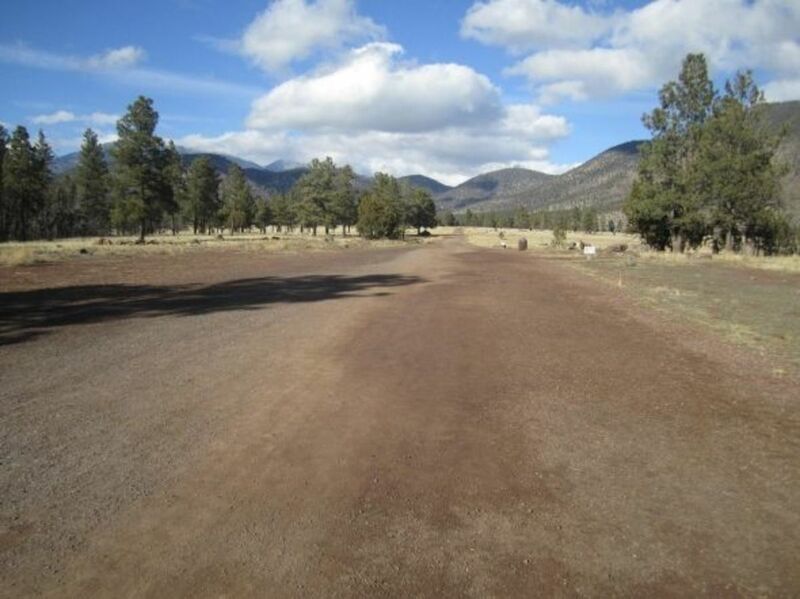 I love to walk my dog and enjoy the fresh Flagstaff air during all seasons on Campbell Mesa trails, located in the eastern part of Flagstaff in the Country Club/Continental area. 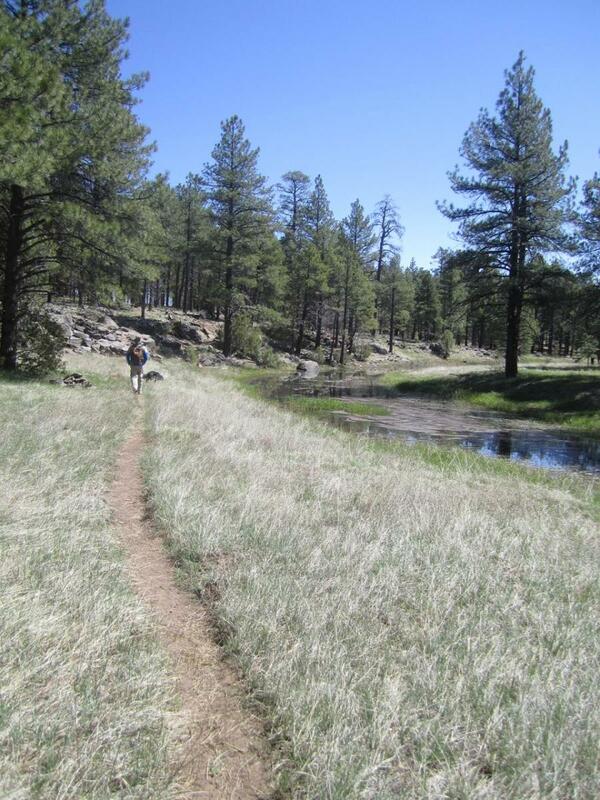 Campbell Mesa offers five easy loop trails, varying in length from just over a mile to 5.7 miles. These gently rolling trails, which pass through open ponderosa forest and grassy meadows, are popular with hikers, mountain bikers and runners and, in winter, snowshoers and cross-country skiers. 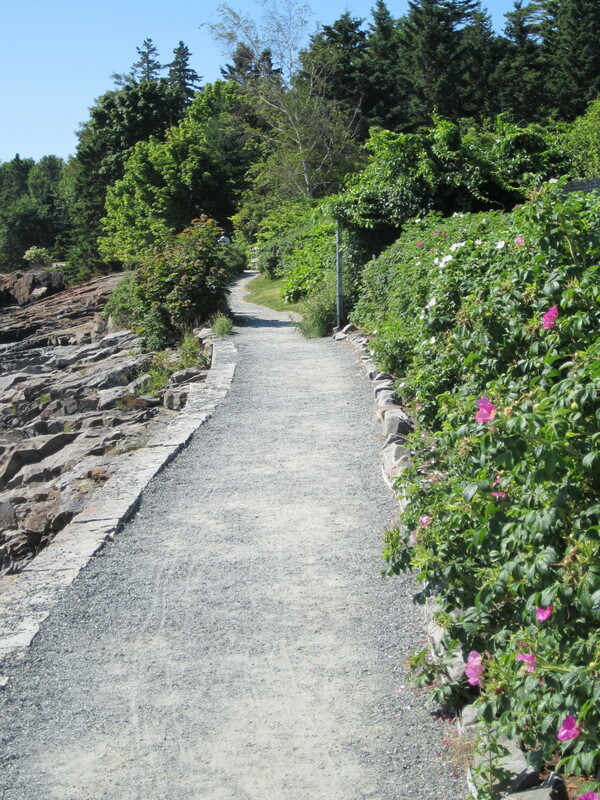 If you can go on a weekday during regular working hours, you'll certainly have less company, but I've never felt crowded on these trails, even on a beautiful summer weekend. The 4-mile Walnut Meadow Loop joins up with a half-mile connector to the Arizona Trail, if you want to extend your hike. Or, of course, you can hike more than one loop. See Campbell Mesa Trail System maps on the Forest Service website. Take Rte 89 East from downtown Flagstaff, past Steve's Blvd. and Fanning. Go right (south) on Continental, towards the I-40 on/off-ramps and Country Club. Pass the golf course on the right and the Flagstaff Athletic Club on the left. Turn left onto Old Walnut Canyon Rd. (at the driving range). The road is paved for a short distance and then turn to dirt (but a 2wd vehicle is fine). The road curves to the right. Look for the parking area with the gate on the left. From there, you can walk around the gate and access the multiple trailheads just a short distance ahead, both on the right and left sides. Looks more like a dirt road, doesn't it? But no motor vehicles are permitted in Buffalo Park (except an occasional, slow-going NFS or maintenance vehicle), only cyclists, walkers and joggers. Oh, and their dogs. With a gorgeous view of the peaks, you can walk the 2-mile loop, which has fitness stations along the way, or snowshoe or ski the larger meadow in the winter. At the rear of the loop, you can access the Oldham Trail and head into the backcountry for a longer hike. Be careful if you wander into the meadow surrounding the Buffalo Park loop. There are very sharp little cacti in the grass that will go right through sneakers. 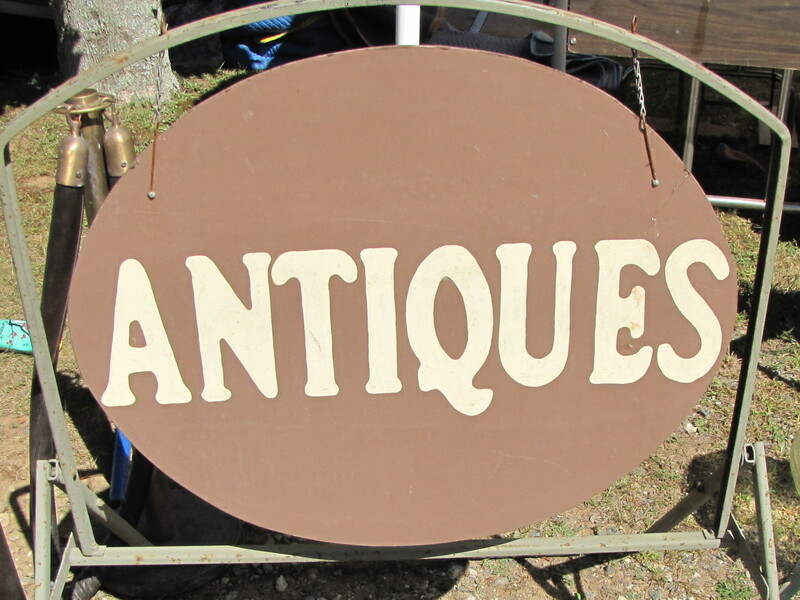 From Route 66/Downtown Flagstaff, take Humphreys Street north to Ft. Valley Road. Turn right at the light onto Columbus. Then it's a short distance to the next traffic light at Beaver Street. Turn left on Beaver, pass the hospital, and then turn left onto Forest Ave.
Continue up the hill on Forest till you get to the traffic light at the top. You'll see a sign for Buffalo Park and USGS. Turn left here and drive about half a mile to the parking area by the Buffalo Park gate. There is no entrance fee. Just walk around the gate. Here's some more information about Buffalo Park from the City of Flagstaff website. This is a very pretty walk in the woods and, at the bottom part of the loop, along a riparian area. The amount of water you'll find here varies by season, but I've always found at least some small pools in the dryer months and as much as a flowing creek with a pond in late summer, during and after monsoon season. Griffith Spring runs into Pump House Wash, then eventually into Oak Creek. I've seen ducks here and other wildlife, including coyote and mule deer. I've walked this trail many times and jogged it a few times too. It's a relaxing walk at the end of a busy day or a great place for a picnic. From downtown Flagstaff, take So. Milton Rd/Route 66 south to Forest Meadows. Turn right on Forest Meadows, then left on Beulah. Continue South on Beulah / 89A approximately 2 miles past the Flagstaff Airport exit and Fort Tuthill. Look for the sign for the Griffith Springs day-use area on the left (east) side of Highway 89A. If you're a list-keeper like me, you could just start with the first hike in the book and do them all. Please be aware that, even though many of these hikes are short or relatively short, the weather in Flagstaff can be extreme here at 7,000 feet and above and can change quickly. Please check the forecast before you go and carry the appropriate clothing and gear, even on a day hike. Are there any hikes that lead to waterfalls in Flagstaff, Arizona? Seasonally, there's a waterfall on the Sycamore Canyon loop trail. Distance varies depending on where you start. As far as hikes in and close to Flagstaff, that's the only one I can think of. What can you tell us about the Locket Meadow trail? Comments or Questions About These or Other Short Flagstaff Area Hikes? My husband and I visit Arizona annually. His mother lives in the Mesa area and My husband likes to ski in Flagstaff occasionally. Your article is a really nice resource I will be referring to for some beautiful hikes in this area. I appreciate the information on directions distances and highlights. You've shown me enough to make me want to go to Flagstaff. Wish I'd known this 25 years ago. Great job! I have to look on from the safety of my couch. Any kind of walk nowadays makes my back go into spasm. 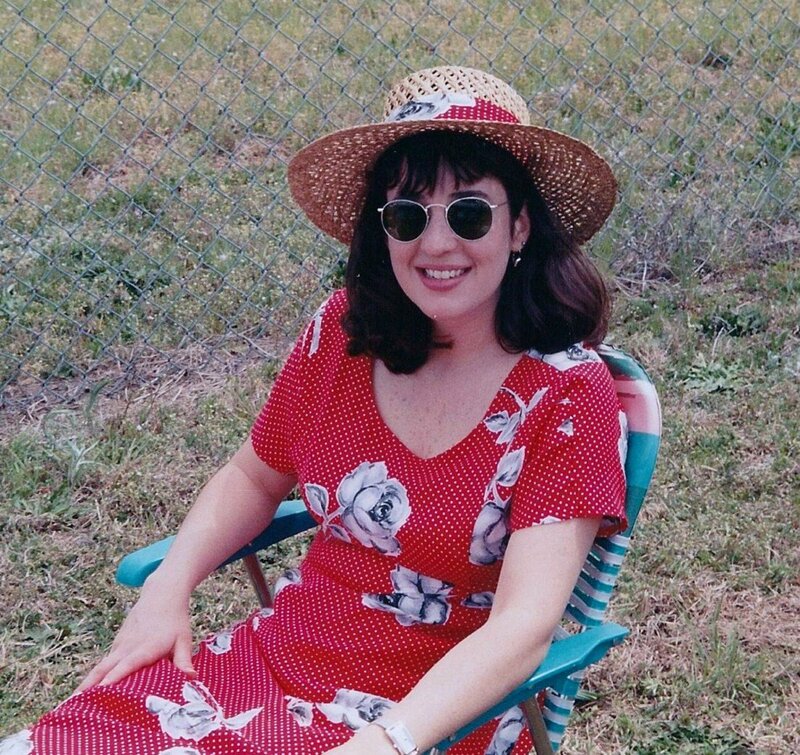 I've been driving my6 husband crazy for a holiday in Arizona for...about 5 years or so. I'd love this sort of thing. 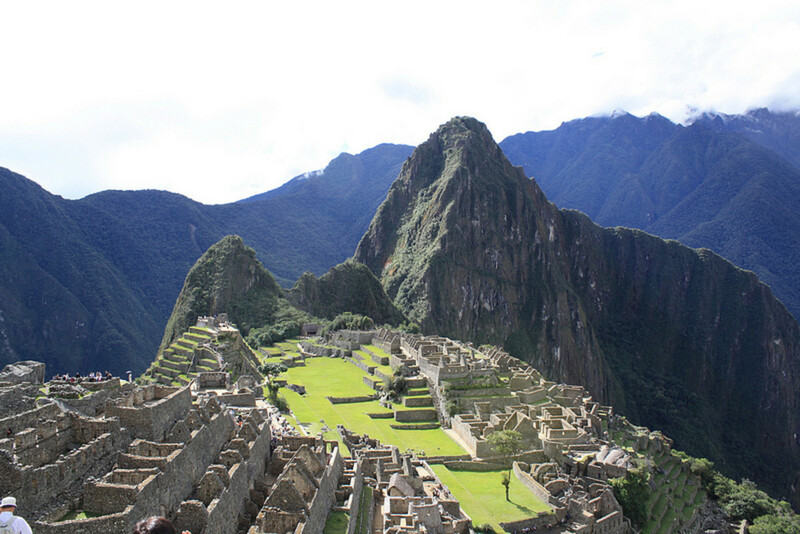 Hope to be able to visit there some day! Thanks for the interesting ideas. This looks amazing. I am not much of a Hiker, but if I ever got near Arizona I would be tempted to take one of these routes. Sweet.....I love this lens! 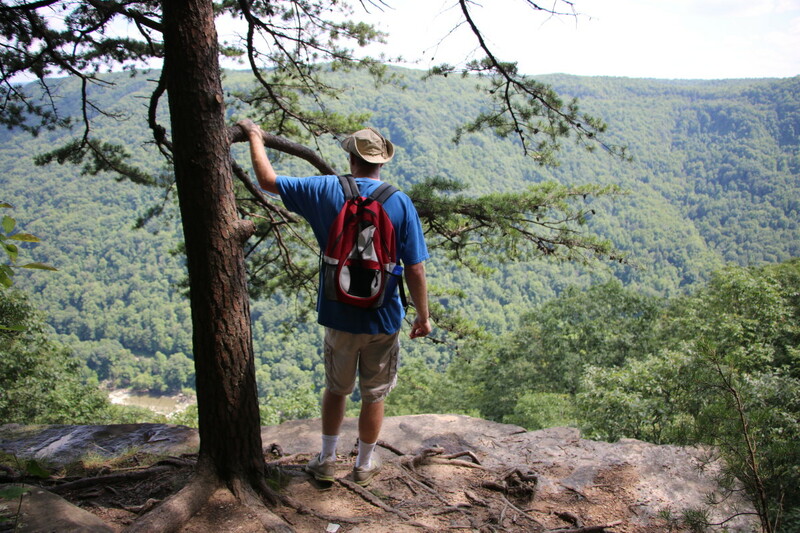 Short hikes are a great way of exercising and enjoying the outdoors. Flagstaff is such a unique place, one reason being the high elevation.